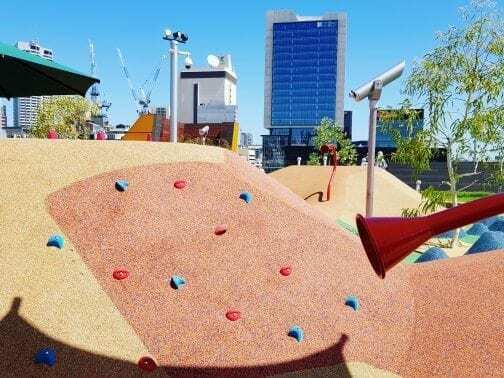 Yagan Square Playground – we have rooftop movies, bars and restaurants… now the kids of Perth have their very own rooftop playground! 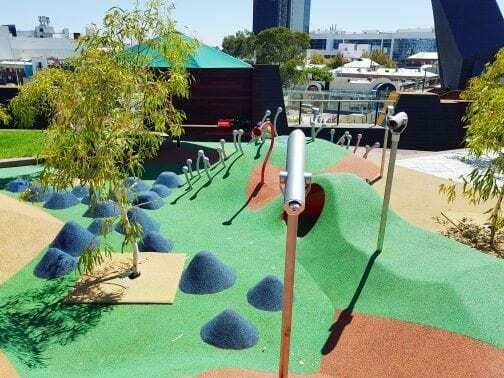 Located within the brand new Yagan Square precinct it is a great place to grab a bite to eat and play while taking in the views of our beautiful City. 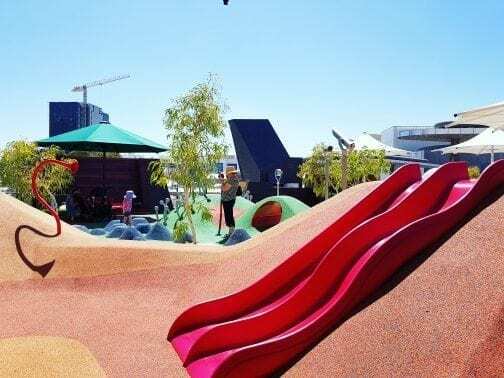 The Yagan Square playground is non-sand based and has been designed to celebrate the geological and rock formations found across regional Western Australia. There is an array of different size softfall mountains to climb with knobs, ropes and rock climbing holds to assist. Located at the top of one of the mountains is a double wave slide. At the top of some of the mountains is a viewing window, children can spy on diners in the Market Hall below. If the kids don’t want to climb the mountains there is a small tunnel they can crawl through. There are smaller softfall rocks for children to leap or jump across. 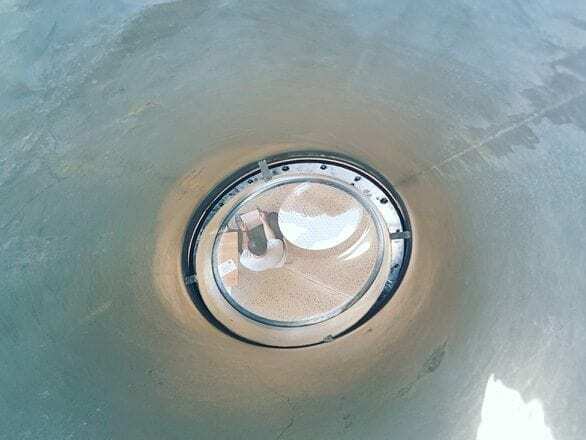 Scattered throughout the playspace are a number of telescopes, kaleidoscopes and speaking tubes. I can imagine the telescopes would be a hit with older children as they have great range. 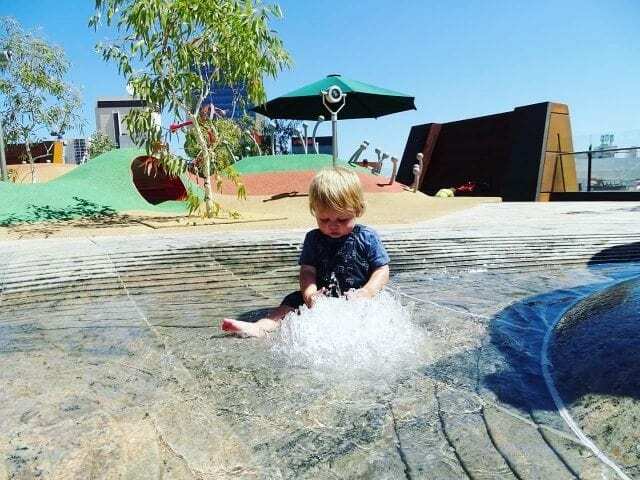 Without a doubt, the biggest highlight is the water play, especially on a hot day. 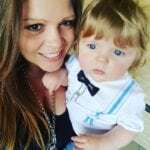 Bring a change of clothes and an aqua nappy for children who wear a nappy. The water play is open 10am – 6pm, closed Wednesdays. 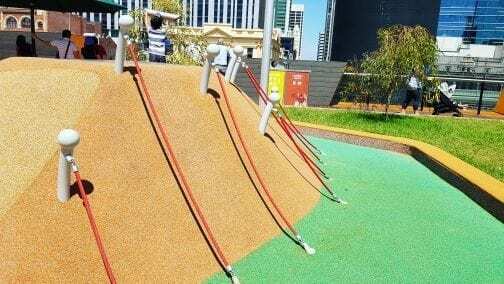 The play area is not shaded (fingers crossed shade sails are installed) – we visited on a warm day and the surfaces were very hot! I would suggest bringing suncream, a hat and thongs or sandals so children can easily transition between water and equipment play. 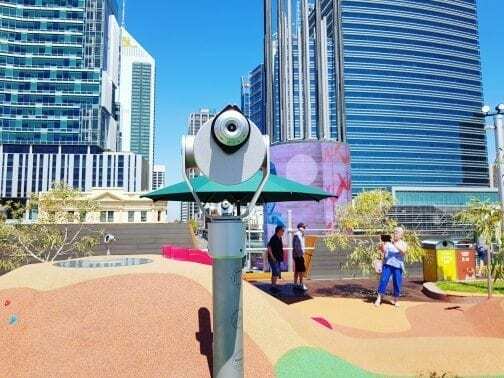 Yagan Square Playspace has a great view of the big screen on the Digital Tower. Screening information is available online. 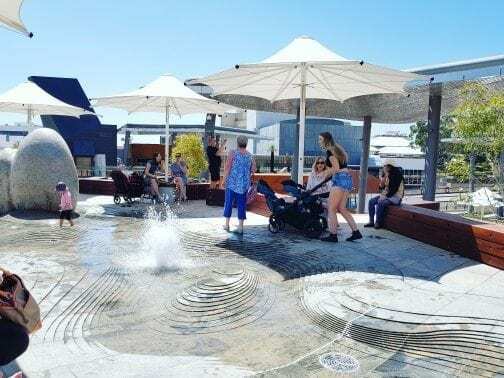 There are a number of shaded areas to sit, viewing areas, a small patch of grass, a drinking fountain, an outdoor shower and public toilets with change table facilities. 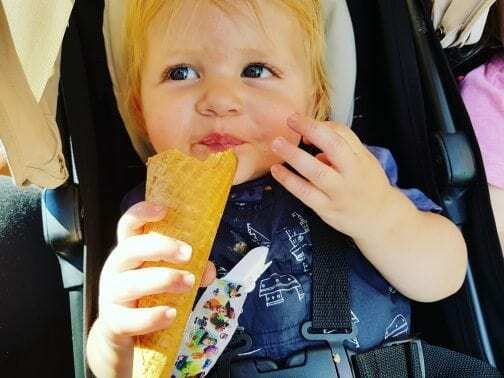 Yagan Square’s Market Hall has some amazing options for a bite to eat, we didn’t stop for lunch but we did enjoy a delicious ice cream from Jersey Jack Gelato! 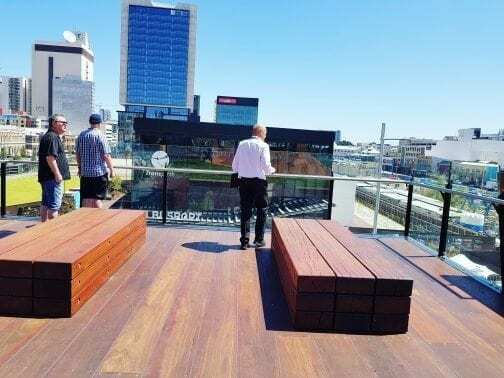 Located within the arms of the heritage-listed Horseshoe Bridge, next to the central Perth Train Station and underground Perth Busport. 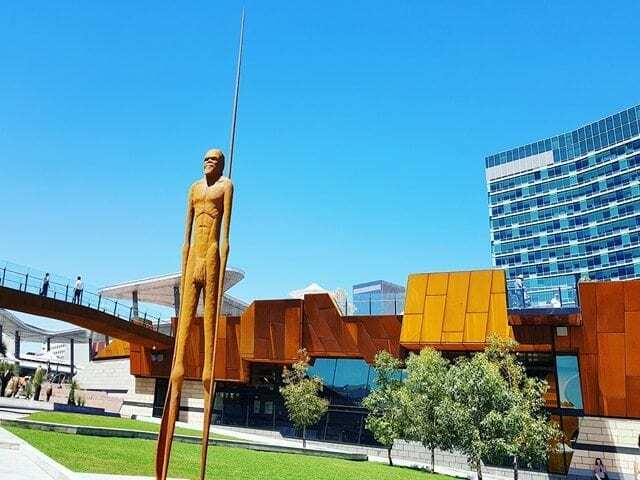 The easiest way to get to Yagan Square is by catching public transport although there are a number of parking facilities a short walking distance away. 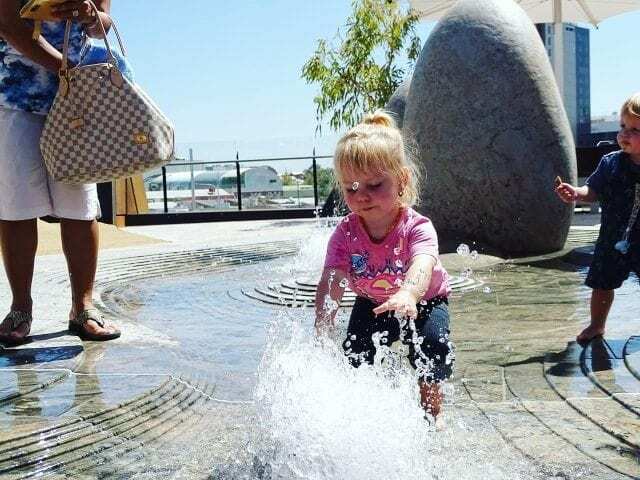 Yagan Square Playspace is always open, the water feature is on between 10am – 6pm daily, closed Wednesdays. 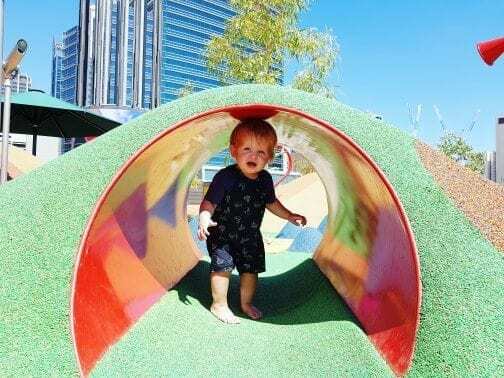 I love Yagan Square, so easy to get to on the train with kids, lots of great choices of places to eat including yummy honey ice cream and cake. 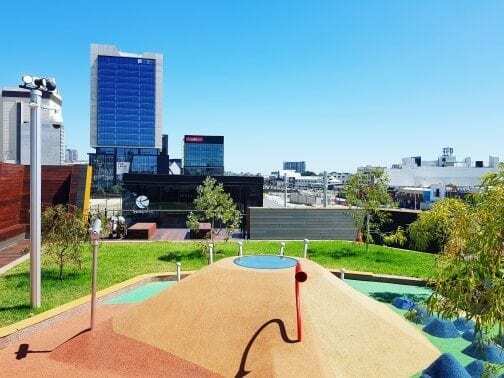 Amazing views from the roof top playground where the kids can safely run free. Well done City of Perth! 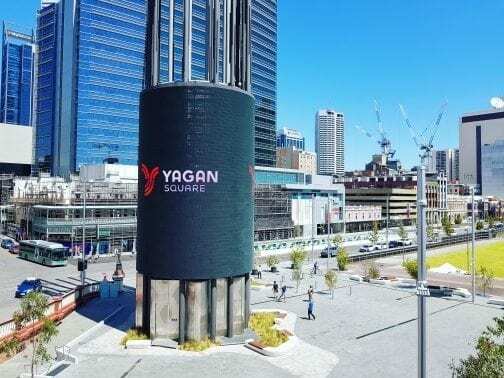 I really like the concept of the Yagan Square. We grabbed an ice cream from the food court before venturing up to the playspace and my son excitedly ventured around the clever architectural design. 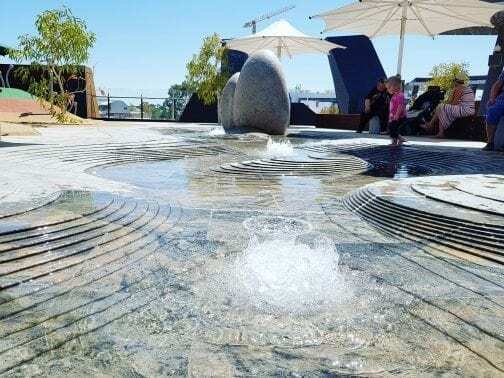 My son liked the water feature which runs through the area but my concern when we visited was the number of intoxicated people wandering around the kids play area, which is next to the toilets. 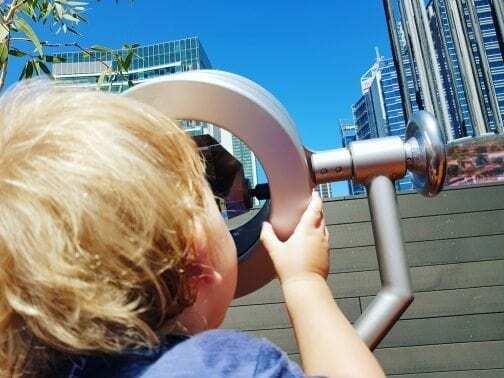 The playspace design means that some in some spots there is no visibility, so at times I couldn’t see my toddler and was trying to run around after him as best I could while I kept an eye on my daughter in her pram. We didn’t stay long at all as an argument kicked off with some of the drunks walking round and I didn’t feel comfortable exposing my children to that situation. 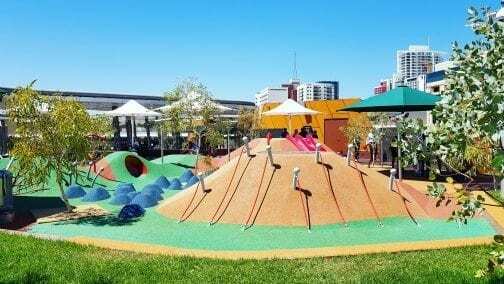 Yagan Square is a lovely facility but unfortunately on the two occasions I have visited there have been numerous intoxicated people around the playspace, so you have to be mindful of the theft potential but first and foremost the security of your children. Such a shame as this is a great inner city facility. 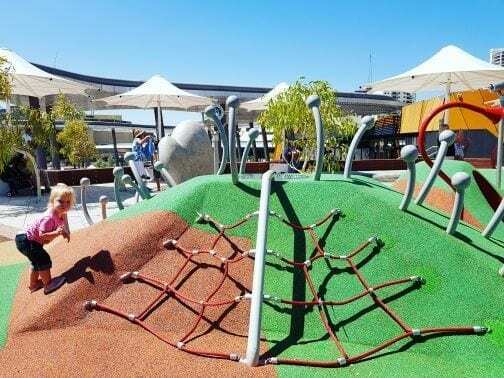 Have visited many times and is my pick of the inner city water playground for baby’s. Started going when my baby was about 5 months and now he is crawling. The water features are small, calm and warmer than others so it’s perfect for the very little ones. The outdoor shower to rinse off the chlorine is a plus too. The soft play space is great too for crawlers, and there will be more to explore as he gets older. It is also a short walk to the Cultural Centre to visit the wetlands and play space there. I have been many times day and night and have not had an issue with anti social behaviour. There are security guards at night also.